There were many dramatic moments during the Second World War that were never captured on film. Paintings step into the picture literally. 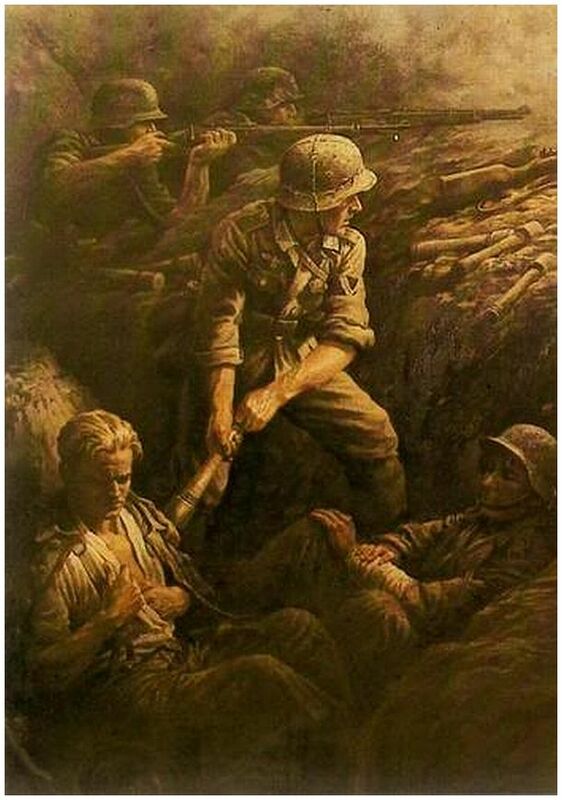 Below are oil paintings that display the dramatic moments of the war. German Blitzkrieg! 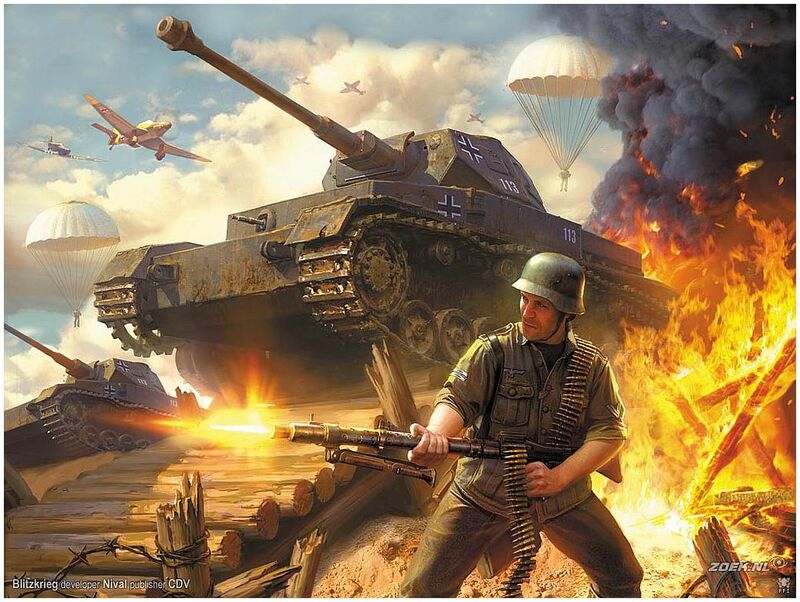 Aggressive German soldiers and lots of tanks! 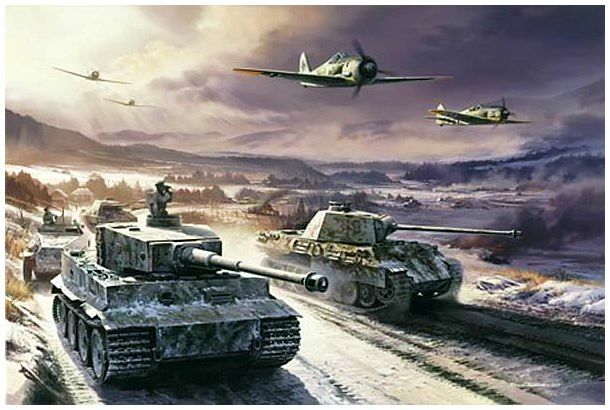 The German counter attack, Ardennes. 1944. 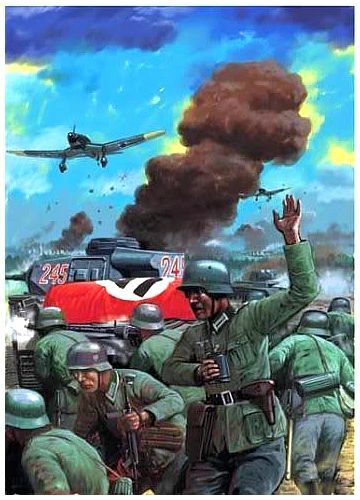 The SS unit moves into the attack. Ardennes. 1944. Soviet army attack German positions in Stalingrad. 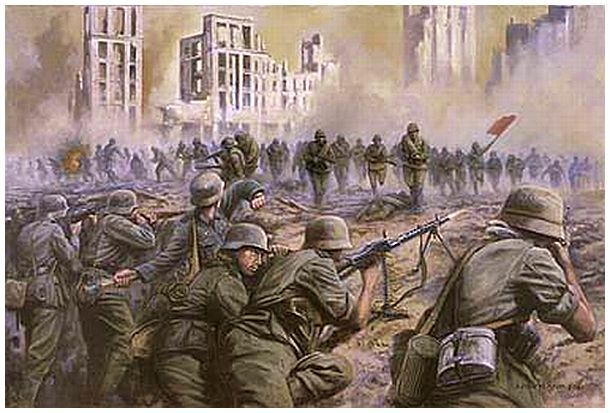 Stalingrad saw some of the hardest and most brutal fighting of the war. Operation Barbarossa. Attack on Russia. 1941. 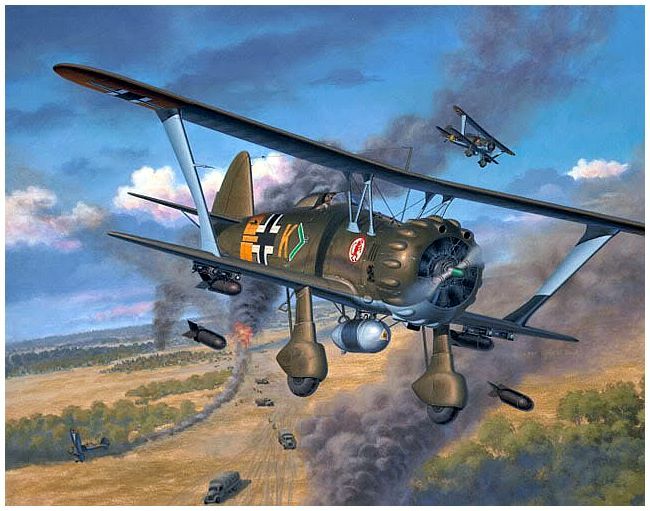 The lethal German dive bomber Stuka delivers its bombs. The shriek of Stuka as it dived was frightening. 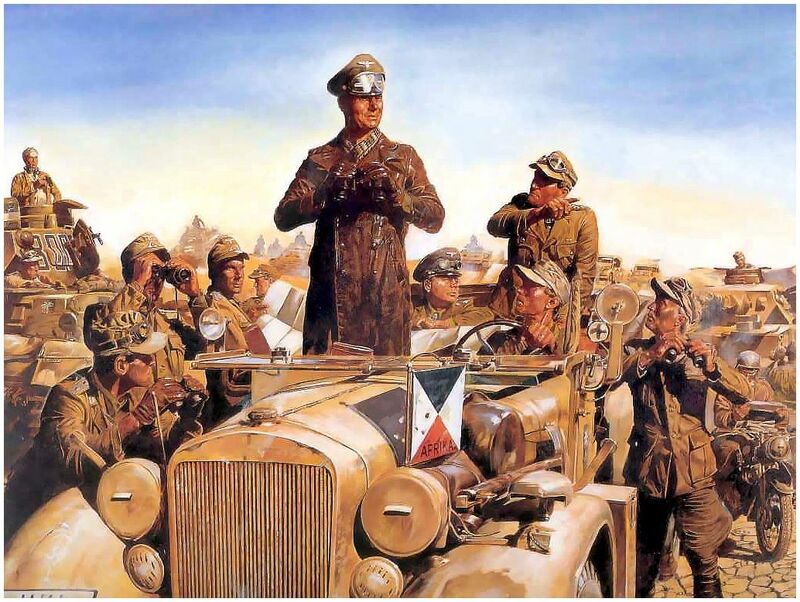 Erwin Rommel in Africa. One of the greatest and gentleman general of the Wehrmacht during the second world war. Benito Mussolini in Africa. He had dreams of becoming another Julius Caesar. WHY WAS THE FIGHTING ON THE RUSSIAN FRONT SO FIERCE DURING WW2? It is difficult to distinguish between the quality of both the German and Russian soldiers. Both were motivated by their love for their motherland. But there were others factors that drove the two sides to such desperate fighting. One, both sides knew that this was a no-holds bar war. Not fighting was thus not an option. Second, both Hitler and Stalin had squads that killed any deserter. Turning away from fighting was just not possible. Thus was seen some of the most bitter, brutal and desperate fighting on the WW2 eastern (Russian) Front. "Be polite; write diplomatically; even in a declaration of war one observes the rules of politeness." "The main thing is to make history, not to write it." "When you have to kill a man it costs nothing to be polite." "In time of war the loudest patriots are the greatest profiteers." "God is not on the side of the big battalions, but on the side of those who shoot best." "Anyone who has ever looked into the glazed eyes of a soldier dying on the battlefield will think hard before starting a war." "Naturally the common people don't want war; neither in Russia, nor in England, nor in America, nor in Germany. That is understood. But after all, it is the leaders of the country who determine policy, and it is always a simple matter to drag the people along, whether it is a democracy, or a fascist dictatorship, or a parliament, or a communist dictatorship. 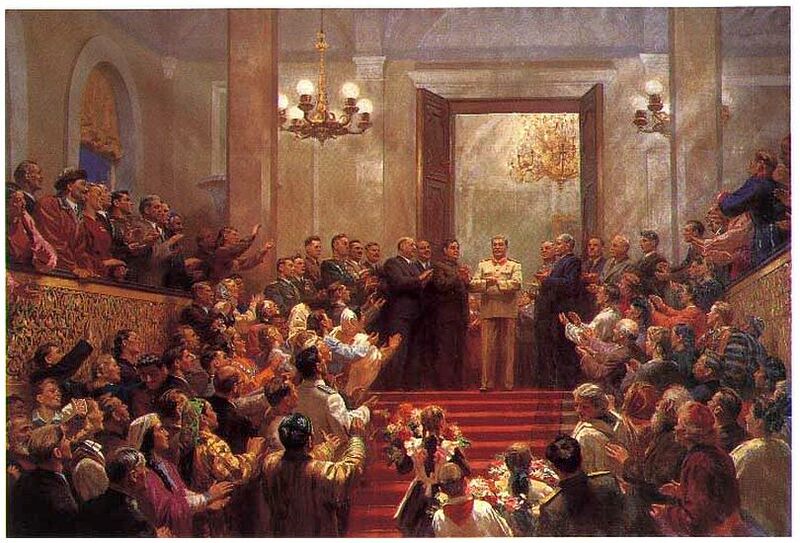 Voice or no voice, the people can always be brought to the bidding of the leaders. That is easy. All you have to do is to tell them they are being attacked, and denounce the pacifists for lack of patriotism and exposing the country to danger. It works the same in any country." "To conquer the enemy without resorting to war is the most desirable. The highest form of generalship is to conquer the enemy by strategy." "All men are brothers, like the seas throughout the world; So why do winds and waves clash so fiercely everywhere?" This site may load slowly at times because of the numerous images. Reload page if some images do not appear. Were There Any Good Guys During WW2? Poland was attacked on September 1, 1939. Why did Britain take two days to declare war on Germany? 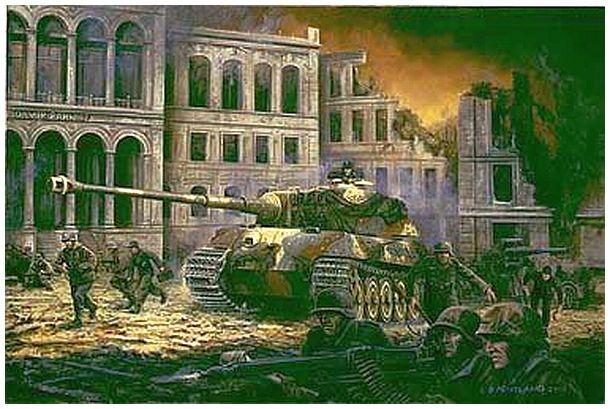 SECOND WORLD WAR: Battle for Leningrad: Why Hitler lost in Russia? What if Germany had defeated Russia in 1941? An SS man is beaten repeatedly on the soles of his naked feet. Two SS men are forced to smear each other’s face with human vomit. Two SS men are shot to death after they surrender their arms to Americans. The lieutenant went to Goering and told him to stop yelling. But he did not stop. The lieutenant picked up the baton and gave Goering a little thump on the head. After that, all was quiet. " 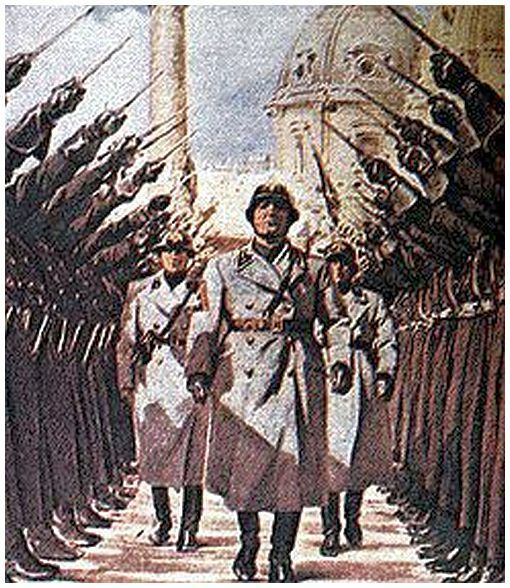 Adolf Hitler came to power in Germany in 1933, leading Winston Churchill to remark, shortly afterwards, 'Thank God for the French Army'. To Churchill at that time, France's army seemed a powerful bulwark against possible Nazi aggression towards other European nations.